Original Sony Playstation 1 Memory card! 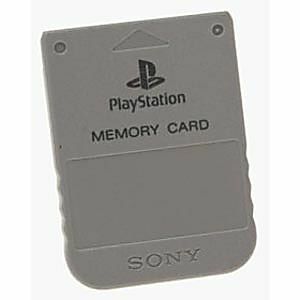 Equipped with 15 blocks of memory, the Playstation 1 MB Memory Card can save or reload your PS1 game data. This is an original Sony brand memory card, not third party! Colors may vary. Great memory card. It work as advertised, Now I can save my progress without having to start over again. Since I was looking into building up a collection of PS1 games to play on my PS2 and finding out PS1 saves won't save on a PS2 memory card, I decided to buy the official PS1 memory card. When I received it, it was in excellent condition and works like a charm with my PS2. Although I do have a minor complaint but nothing too serious, the previous save data wasn't erased from the memory card but it's not really a big enough issue to fuss about. Still a great working memory card regardless and I definitely recommend this to anyone looking into PS1 related stuff. A must have for any PS1 games, assuming you want to save. This is wonderful. I bought two of them, so my sister and I have different cards. One still had games from the previous owner saved on it, but it was really simple to erase those to make room. If you have a PS1 or PS2 you need a few of these for sure. Can't really play any longer games without them. I have six of them but will be needing more at some point. This memory card has saved my games! I am so happy that it works and that I found it so inexpensively on Lukigames! This memory card is extremely expensive on other gaming sites! Service was fast and I got it sooner than expected. I'd order from lukigames again! This memory card is a life saver because all my games were not being saved, but after I got this all my games save now!! !